66 • May 2018 • S I G N & D I G I T A L G R A P H I C S ARCHITECTURAL AND ENVIRONMENTAL Industrial Duty Laser Labels and product identification keep the machine running B Y R I C K W I L L I A M S Shop Talk Perhaps the most challenging of them is the jobs we are asked to do that involve producing custom control panels from stainless steel, generally 16 gauge (about 1/16") to 12 gauge (about 1/10") sheet. Stainless steel in any thickness is expensive, so prototypes are definitely required. Fortunately, if your graphic software can read a CNC file (.dxf, .dwg, etc) accurately, prototyping can be done very well using thin posterboard. Our software will import these files, but does not connect the lines or create paths—but can be made to do so with a bit of tweaking—and the dimension accuracy is very good. For quick yet accurate prototyping, we keep some thin white posterboard—which is available in full 4' x 8' sheets—and is cut into smaller sheets to fit our laser (24" x 39"). Before engraving and cutting, we simply spray a light coat of fast-drying spray can primer over the sheet. The engraving shows up as white, and the laser makes short work of cutting out our control panel mock-up, with all inside holes and accurate outside shape. If the client makes changes to the first version, which is quite likely, alterations are incorporated in our design and another paper version is produced. Only after the customer has approved the final version, which may require more than one revision, is the real item cut on a CNC waterjet. After that, it is cleaned, surface prepped, and coated with laser marking spray (CerMark), which is water soluble but leaves a totally indelible black mark on stainless. This coating only works on stainless, but it really does work and cannot be removed or weathered off. There is a trick to making these stain- less items clearly readable, since stainless steel is quite reflective, even with a brush finish, and lettering on its typical surface is hard to read. 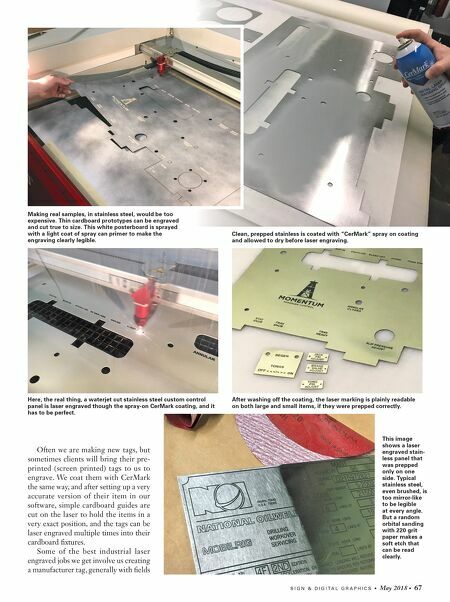 We have found, through trial and error, we can produce a fine satin finish that is not reflective and has much improved read- ability if we etch the surface of our control panels with a random orbital sander. The sander must be "random orbital," and we like using 220 grit sanding disks, going over the surface until it is evenly etched and uniform in appearance. Our customers have been very satisfied with this satin silver patina and the clarity of laser marking on it. A sign shop laser cutter can be used for a wide variety of applications, from basic engraving to cutting acrylic letters and logos. 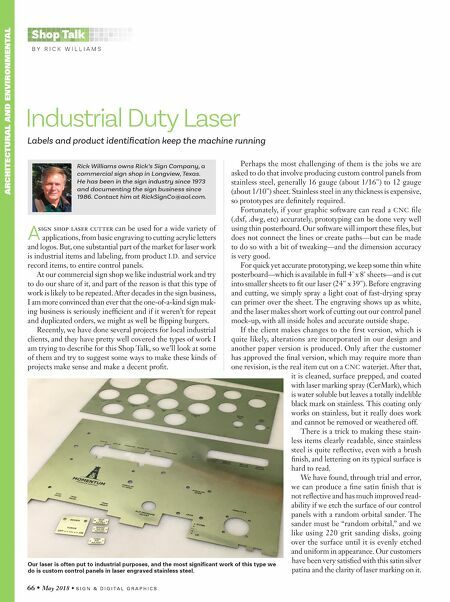 But, one substantial part of the market for laser work is industrial items and labeling, from product I.D. and service record items, to entire control panels. At our commercial sign shop we like industrial work and try to do our share of it, and part of the reason is that this type of work is likely to be repeated. After decades in the sign business, I am more convinced than ever that the one-of-a-kind sign mak- ing business is seriously inefficient and if it weren't for repeat and duplicated orders, we might as well be flipping burgers. Recently, we have done several projects for local industrial clients, and they have pretty well covered the types of work I am trying to describe for this Shop Talk, so we'll look at some of them and try to suggest some ways to make these kinds of projects make sense and make a decent profit. Rick Williams owns Rick's Sign Company, a commercial sign shop in Longview, Texas. He has been in the sign industry since 1973 and documenting the sign business since 1986. Contact him at RickSignCo@aol.com. Our laser is often put to industrial purposes, and the most significant work of this type we do is custom control panels in laser engraved stainless steel.